The Best Crockpot Chili- Easiest Ever! Light & Creamy Grape Salad ~ The Favorite Traditional Grape Salad Recipe Lightened up with a Few Simple Ingredients! A few years ago there was this big rage all over social media about all Minnesotans eating Grape Salad. From what I remember it made it sound like this was pretty much the only salad we knew how to make and it was at every function we ever went to. It may have made fun of all things Minnesotan, I’ll let you imagine that if you’ve ever watched Fargo, and may have made us look like hicks. This may or may not be the truth. I may have slightly exaggerated this in my head and made it a little more dramaworthy than it actually was. 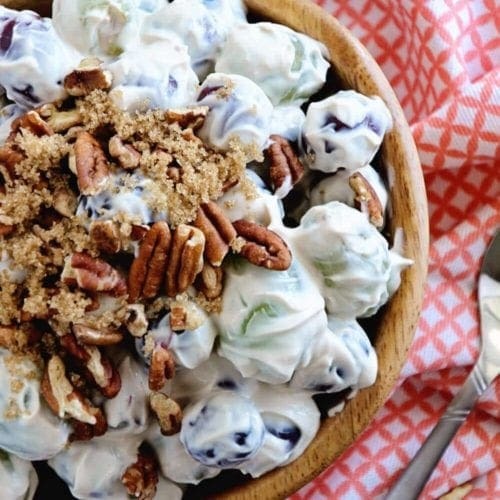 My point is apparently the Grape Salad is all the rage in Minnesota and I just might live under a rock because out of all the potlucks I’ve been to I’ve never once saw this salad! Ever since I heard about the infamous Grape Salad thanks to social media I’ve been incredibly curious about this super popular salad in the great state of Minnesota. I’ve kept my eyes peeled at every gathering hoping for a glimpse of it and even better, a taste of it. I knew it would be bursting with fresh grapes yet creamy which I really couldn’t imagine being all that great. I love grapes. I love creamy. But mix them together and I was a little terrified. Therefore this summer I decided to take things into my own hands and make this for myself since no one else was doing it for me! Of course I lightened it up a bit from the recipe that I found to make it a little more bikini friendly, not that I wear one or ever will wear one, but in case you do well I was looking out for you. Your welcome. My dear, sweet friends please run out to your local grocery store, recipe in hand, gather all the ingredients and make this stat. I know I said I couldn’t wrap my head around the flavor combo but wow it’s amazing. The cool grapes burst in your mouth full of flavor and the creamy dressing is nothing to shake your head at. This Minnesotan can finally say she’s ate the famous Grape Salad of our state and proudly say she’d make it for anything gathering that she goes too! 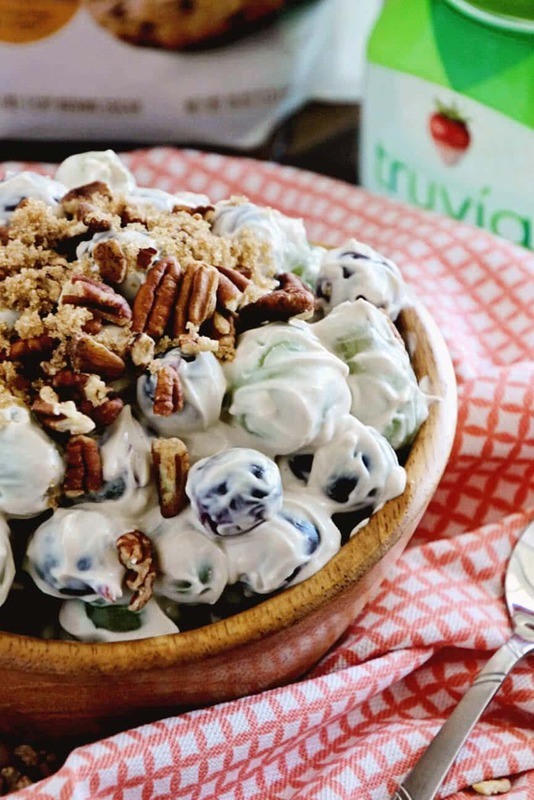 I lightened this grape salad up using zero-calorie Truvia® Natural Sweetener. My favorite secret ingredient because it helps me reduce the calories and sugar in this delicious salad while not sacrificing the flavor. Truvia® sweetener is natural, great-tasting sweetness that was born from the leaves of the stevia plant. This is bursting with grapes for a refreshing dish which is perfect for a hot summer day! 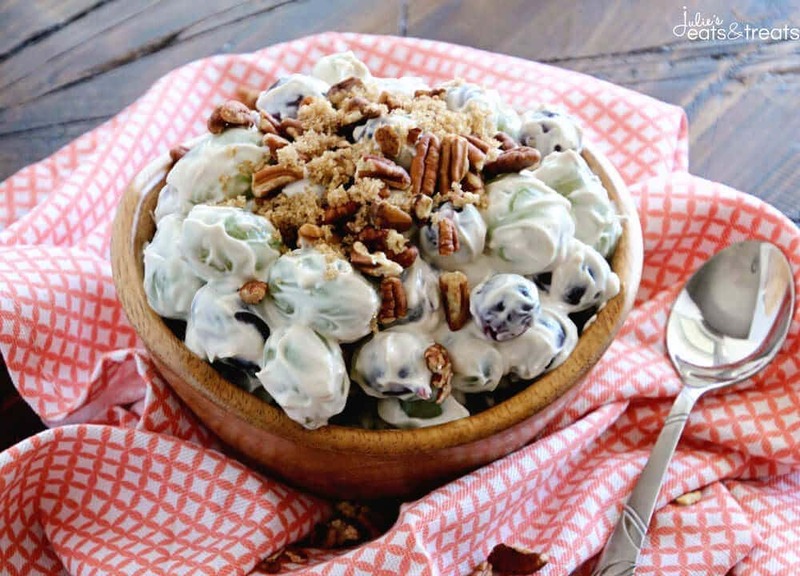 The Favorite Traditional Grape Salad Recipe Lightened up with a Few Simple Ingredients! s! In a large bowl, beat the Neufchatel cream cheese, yogurt, Truvia and vanilla until blended. Add grapes and toss to coat. Transfer to a serving bowl. Cover and refrigerate until serving. Sprinkle with Truvia brown sugar blend and pecans just before serving. Tried this recipe?Follow me @julieseatsandtreats and mention #julieseatsandtreats! Things You Might Need for This Recipe! Try These Recipes Using Truvia! Strawberry Lemon Fluff Angel Food Cake ~ Light, Fluffy Angel Food Cake Pilled with Light & Creamy Lemon Filling and Fresh Strawberries! Cinnamon Cream Cheese Frosted Banana Donuts ~ Delicious, Easy, Moist Baked Banana Donuts Topped with Cream Cheese Frosting Loaded with Cinnamon! Crock Pot Peanut Butter Banana Oatmeal ~ Easy, Overnight Oatmeal Loaded with Peanut Butter, Bananas, Steel Cut Oatmeal and Flax Seed To Get You Going in the Morning! I'm here to help you win in the kitchen again! Life is Busy, Life is Crazy, but that doesn't mean you can't make your family dinner! Julie's goal is to provide you with easy, family, friendly recipes that use pantry staples. Dinnertime will be stress free again! Yum, I only recently tried this salad a couple years ago, so I missed the Minnesota salad bandwagon too apparently. But my oh my, is it delicious! 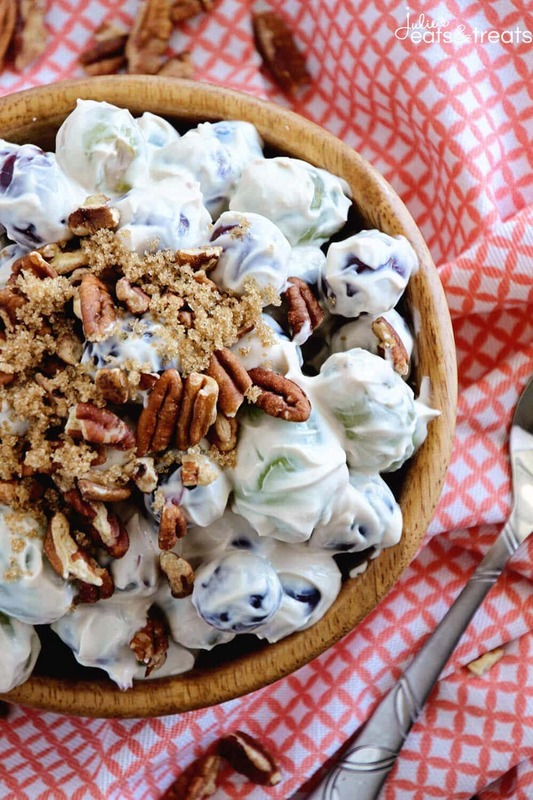 Grape salad is the perfect summer side dish! The version I’ve had before includes crushed butterfinger candy bars, which is delicious but not quite as good for you as this one. Looks fantastic! I’ve never had grape salad, but this sounds really unique! I love the nuts on top. “…but mix them together and I was terrified.” Lol! I have to admit, hearing ‘grape salad’ I was a little terrified, too. But this looks amazing and nothing to be scared of. In fact, I want a giant bowl! I have to admit, I have never heard of grape salad. It is very intriguing…I have to try this! Don’t feel bad about this salad going under your radar. I think it’s made the regional rounds for years, case in point, I’ve heard this called California salad, Napa Valley Salad, Sonoma Salad as well as here in Tennessee; Southern Grape Salad. Sometimes with the addition of chicken and/or broccoli. Suffice it to say, it’s a great basic salad that can go many directions. Really? I didn’t know it went by so many names and different areas put different twists on it! I’m in Minnesota & had never heard of this before & then when I was in Colorado a few weeks ago someone brought this to a gathering. It was wonderful. Glad I’m not the only Minnesotan that had never heard of it! and get my quick 30 minute meals e-cookbook for free!